Properties in Sedona Art Center average 4.7 out of 5 stars. 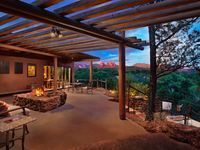 Sedona Summit - Beautiful Resort With Breathtaking Red Rock Views! 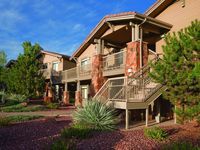 Property 8: Sedona Summit - Beautiful Resort With Breathtaking Red Rock Views! Room had everything we needed and was close to places to get what we wanted! Words and pictures can&rsquo;t do justice to the perfect stay we had at this private resort. Every detail was right. The setting is beyond compare with incredible views from every gorgeous window and outdoor space that change with every change of the light. It&rsquo;s remote enough to feel completely private yet an easy drive into town. The casita itself was pure luxury. From the subtle clean smell of the place, to the elegant fixtures and amenities, to the kind yet unobtrusive attention from our hosts, we felt pampered and comfortable. The outdoor spaces are phenomenal - hard to beat watching the sunset over Cathedral Rock from the spotlessly clean hot tub or listening to the creek rush by while enjoying a hot, private bubble bath. There are places to explore - we saw javelina from a distance - and a picnic table by the creek. If you are looking for a once in a lifetime splurge, this is the place. I am so grateful we were able to experience it.